If you’ve flown on long-haul flights, you’ve probably already tried one of the best travel pillows. Those flights can be brutal! 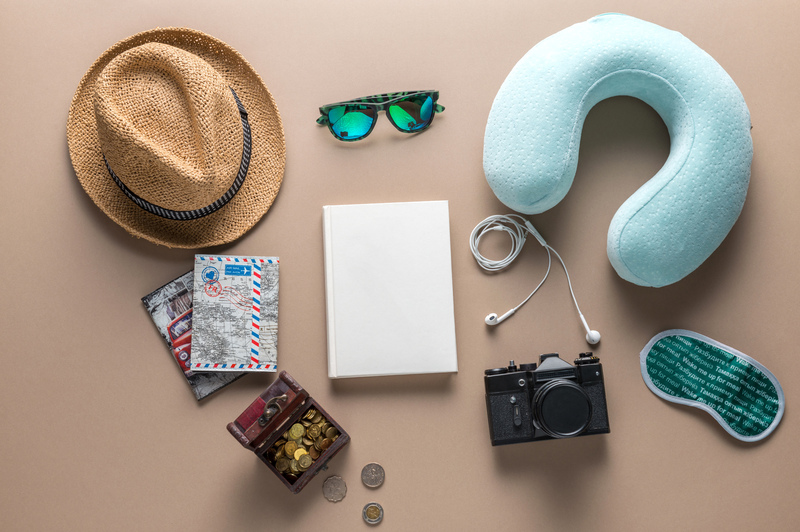 Personal care items can make long periods of air travel or ground travel more comfortable, and one of the best options is travel pillows. These essential pieces of travel gear are among the best gifts for travelers, help prevent jet lag, and are an easy way to improve travel. Here are the top 5 best travel pillows and information on how to choose the best one. 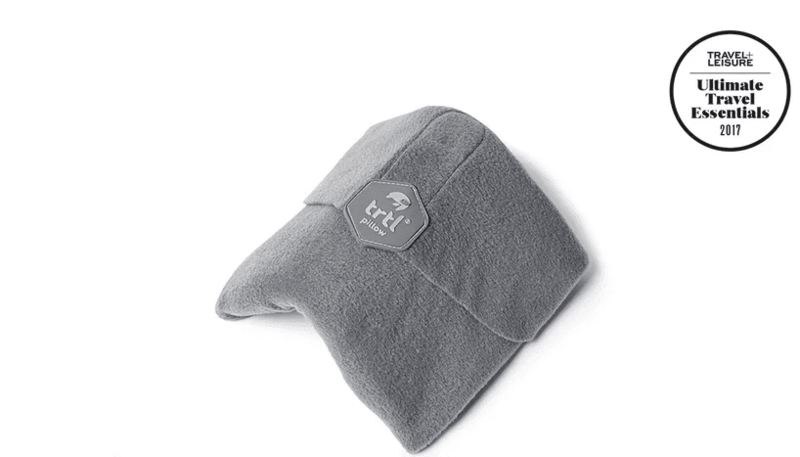 The Trtl travel pillow doesn’t look like a travel pillow. It’s not U-shaped, cushion-shaped, or inflatable. It doesn’t even look like a pillow! Don’t let its looks deceive you. The Trtl travel pillow is hands-down our favorite travel pillow and is unlike any other travel pillow we’ve tried. Made of soft fleece fabric, this premium travel pillow wraps around your neck and has a wireframe inside which support your head. Once it’s on your body, it secures with Velcro and firmly holds your head and neck in place. Lightweight: This pillow weighs about the same as a scarf. Machine-washable: If you spill something on the pillow or like to clean it between adventures, you can throw your Trtl into the washing machine. Portable: The Trtl is more like a scarf than a pillow. It folds for easy transportation. Secure: An interior wireframe ensures your head and neck get the support they need. Soft: The pillow is made of soft, fleece fabric. Headphone fit: Like to fall asleep watching movies or listening to music? If so, this may not be the best travel pillow for you. Trtl can be hard to fit headphones over. Non-adjustable: This is a one-size-fits-all travel pillow, meaning the internal neck support system cannot be customized. If you’re a side sleeper, we know it’s near-impossible to get comfortable on an airplane. A travel pillow can help. 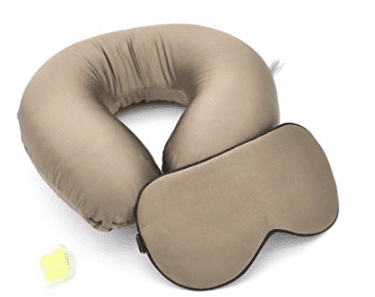 The Travelrest Memory Foam neck pillow is the best pillow on the market for side sleepers. It’s not your average travel pillow. It doesn’t even look like a travel pillow. It’s an inflatable, cylindrical pillow that has a patented ergonomic shape and attaches to the “wings” of an airplane seat or car seatbelt. This feature makes them ideal for both air travel and land travel. 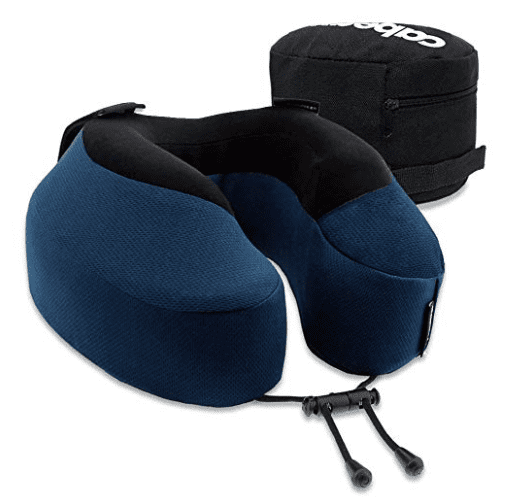 Full lateral support: This travel pillow supports the upper body, not just the neck. If your head nods forward, the shape can also keep your head in a comfortable position. Inflatable: This pillow inflates, which means you can adjust the firmness as needed. Machine washable: This feature makes it much easier to clean up after a trip. Portable: This pillow attaches to luggage to make transport a breeze. Two-year warranty: The manufacturer gives you a two-year warranty, so you know your investment will be worth it. Strange-looking design: If you care what other passengers think of you, you might not want this pillow. This travel pillow is not like any other travel pillow we’ve come across, and it may elicit a few stares. 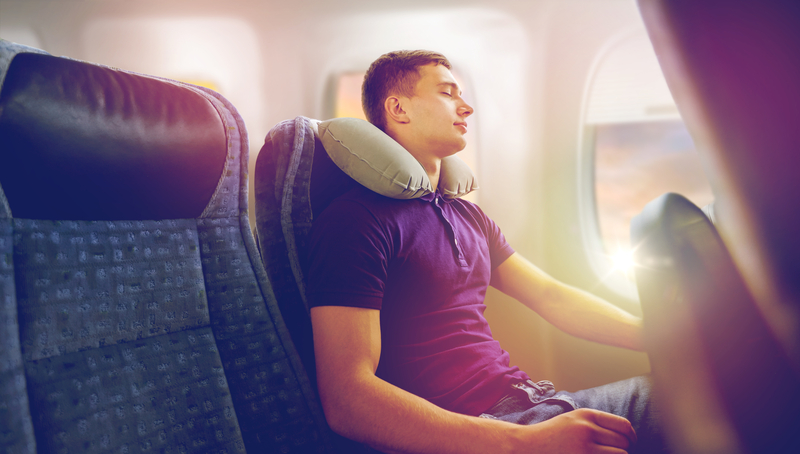 Does your neck tend to jerk back and forth, or up and down whenever you fall asleep on flights? This situation can cause you both unrest and neck pain. The Cabeau Evolution S3 can help prevent this unfortunate position. 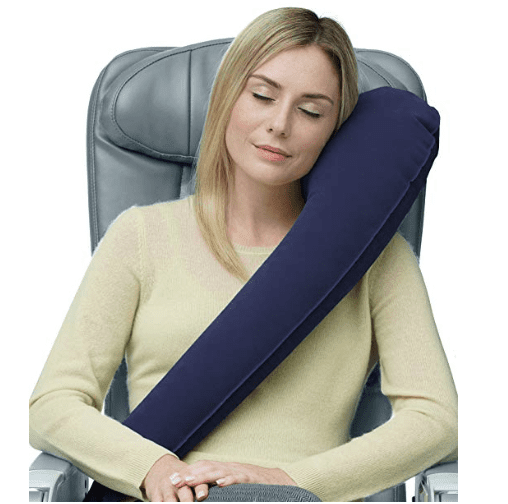 This travel pillow straps to your seat, wraps around your head, and gives you chin and head support. Contoured support: The soft memory foam helps this pillow contour to your neck and head. A tie locks the front of the pillow in place, adding additional support for your chin. Machine washable: This pillow is machine washable and dries quickly. Satisfaction guaranteed: Cabeau offers a money-back guarantee. If your travel pillow is damaged or defective in any way, Cabeau will replace it. Low portability: Because the pillow is made of soft memory foam, it is not as easy to transport as an inflatable option. Weak drawstring: Customers have complained about the front drawstring breaking. However, the company will replace defective pillows. Traveling with kids can be difficult, but it’s worse when they don’t get enough sleep. Sleeping on airplanes is hard for anyone, and kids are no exception. An adult-sized travel pillow isn’t a good fit for children because kids have smaller bodies. Thankfully, some companies design travel pillows to be kid-friendly. 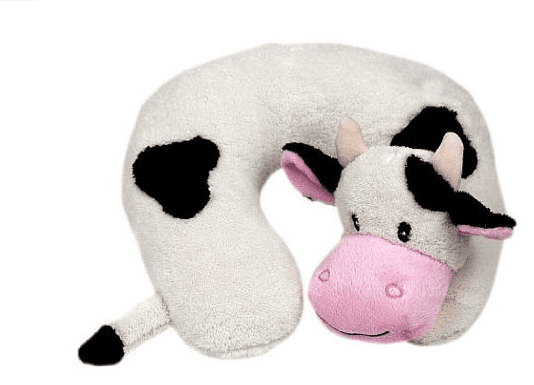 The Cloudz Kids Plush Animal Travel Pillow is our favorite. Not only is it adorable (it comes in 19 different animal forms! ), but it’s soft, plush, and kid-sized. We can’t guarantee your child will sleep on the flight, but this sleep resource will help. Child-friendly shape: Kids usually can’t use adult-sized travel pillows. This one is specially engineered to fit around a child’s neck. Fun designs: Kids like cool things, and they’ll love these adorable animal-shaped, cuddly neck pillows. You can choose from an alligator, bear, cat, dinosaur, dog, ladybug, lion, unicorn, monkey, moose, panda, pig, tiger, and more. Polyester material: These pillows are made of 100% polyester and are super soft and plush. Children only: If you wish you could get a cow-looking travel pillow for yourself, we have bad news for you. These travel pillows don’t come in adult sizes. Low quality: These neck pillows aren’t the best quality, and customers have complained about them wearing out quickly. 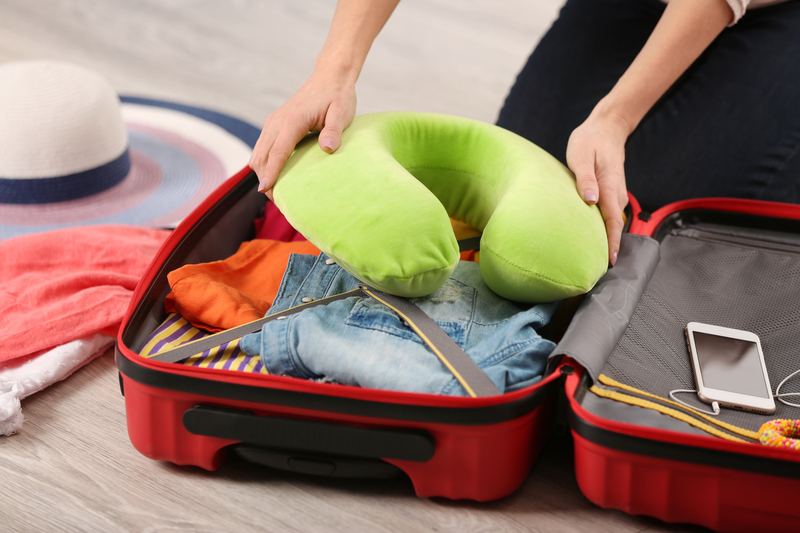 If your child only travels once or twice a year, the pillow should hold up. If they travel more often, consider a different option. Looking to splurge on a luxury travel pillow and don’t care how much you spend? Check out this premium travel pillow from Jeehui. The exterior is made of mulberry silk and the interior filled with natural latex, making the pillow both soft and supportive. Bonus items: This travel pillow also comes with a silk eye mask and a pair of memory foam earplugs! Firm support: An interior natural latex filling provides firm yet plush support to ensure you sleep soundly. Soft material: The pillowcase is silk, so it is super soft and luxurious against your skin. Plus, it will keep you from overheating while you sleep. Limited support: This travel pillow is less supportive than foam pillows. Pillows are a personal thing, and travel pillows are no different. Some people prefer pillows to be hard while others like them as plush as possible. 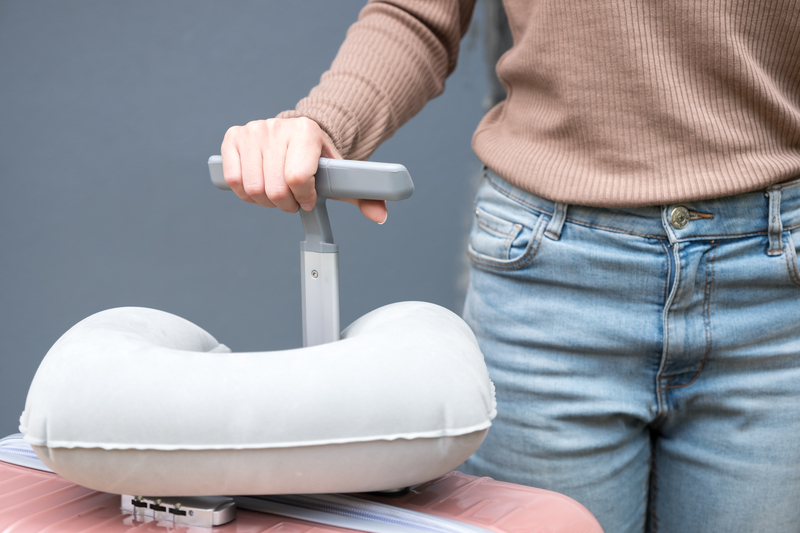 Some people hate carrying extra bulk and would prefer to have their travel pillow as compact as possible, while others check their bags and can afford to bring a larger pillow. 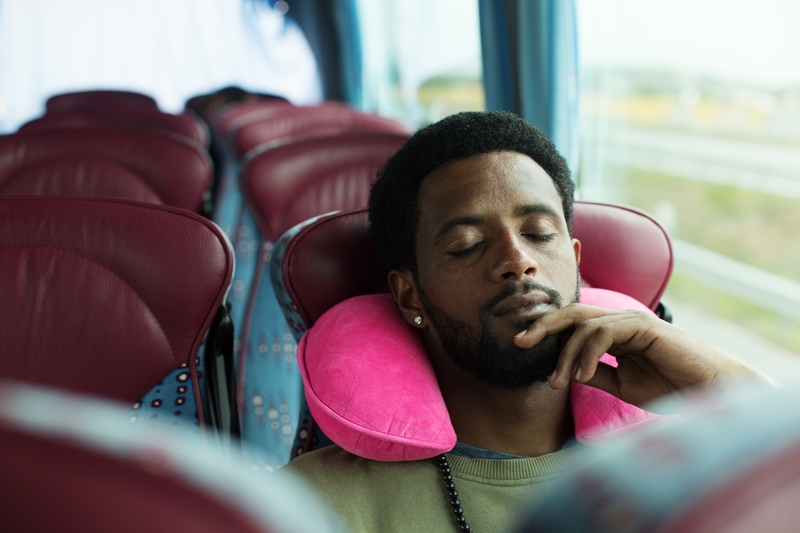 Consider the following things to help you pick the best travel pillow for your needs. Have you ever dozed off on a plane only to wake up a few seconds later with your head jerking, jolting you awake? Or, have you ever woken up with a neck cramp thirty minutes after falling asleep? Thankfully, neck pillows for traveling can help if you find the right blend of comfort and support. The first thing you want to look at with a travel pillow is how supportive it is. Will it comfortably prop your head up? 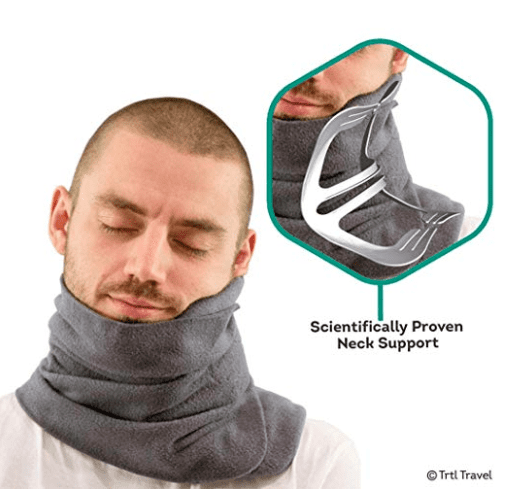 Will it prevent your chin from falling into your chest? Does it fit nicely around your neck? Try out a few pillows to get an idea of what will support your body the best. A travel pillow can be super supportive, but if it feels like rocks, you’re not going to want to use it. What’s comfortable for one person may not be ideal for someone else, so make sure you test the travel pillows out for yourself. Is the filling too soft or too hard? Is the material scratchy or smooth? Will the shape support you where you need support? Take the time to evaluate your picks for the best travel pillows because comfort and support can make or break a pillow. While standard pillows are square or rectangle, travel pillows come in lots of forms. Use this guide to sort through the best travel pillow shapes. A collar-shaped travel pillow is similar to a U-shaped travel pillow. However, a collar-shaped pillow can provide 360-degrees of support. While it is in the shape of a U, this pillow has higher sides (typically up to your earlobes), and the front-closure adds support for the chin. If you’ve ever flown in Business or Premium Economy, you’ve likely tried the pillow that the airlines gave you. If you liked it, you might like using a cushion for your travel pillow needs. You can find one as plush or as soft as you like and can bend it, fold it, and position it for your sleeping needs. Cylinder-shaped travel pillows aren’t for everyone. They can be awkward and provide less support than collar-shaped or U-shaped travel pillows. They are ideal for those with sore necks because you can move these pillows to where you need support. A U-shaped travel pillow is a plush pillow in the shape of a U. This style is designed to rest on your shoulders and hug the back of your neck. Material plays a significant role in comfort and support. Travel pillows can have a filling in one material and a different one on the outside or be the same throughout. The texture impacts how comfortable a pillow is. 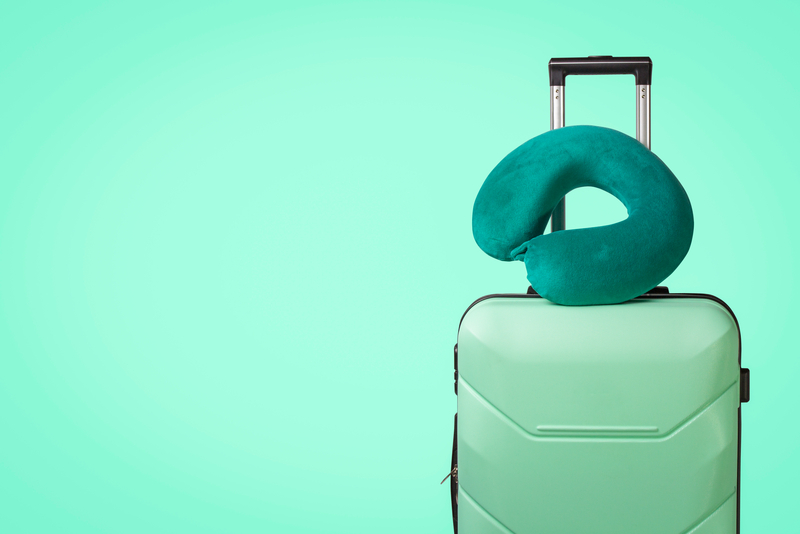 A travel pillow can be as supportive as possible, but if it uses a scratchy fabric, you won’t want to rest your head, chin, or neck on it for hours at a time! Use this guide to help you identify which material you’ll prefer for the filler and outside of your pillow. Back in the day of traditional travel stereotypes, inflatable travel pillows were some of the only travel pillows on the market. And they were awful! Thankfully things have changed. These days, inflatable travel pillows are often U-shaped, inexpensive, and wrapped in a soft exterior to make them more comfortable. The best part about inflatable travel pillows is their portability. Roll it up and put it in your carry-on or purse, blow up in-flight when you’re ready to doze, and then deflate as soon as you land. They barely take up any room. Did you know that some travel pillows have a filling of tiny micro-beads? These travel pillows are similar to foam and provide firm support and help alleviate joint and neck pain. Beads are superior to foam, however, in their breathability. Foam lacks the airflow that micro-beads have and can become hot. If you need firm neck support but sleep hot, you may prefer a micro-bead travel pillow. Foam mattresses are one of the most popular types of beds, especially for people with joint pain. They hug your body and provide support in just the right places. Thus, it should come as no surprise that foam travel pillows are some of the best travel pillows. Similar to their mattress counterparts, foam pillows provide firm support, hug your neck and chin, and prevent neck and back pain. Foam comes in several options. Many travelers swear by memory foam pillows. Most travel pillows come with polyester covers, but they can also be filled with polyester materials as well. Polyester pillows tend to be soft and malleable, and they are often considered some of the “basic” travel pillows. Silk feels great against your skin and make some of the most cooling pillows. While silk is luxurious, watch out if you’re a drooler. It will leave a mark! Some travel pillows have eco-friendly wool or even lambs-wool as the filler or outside covering. This material perfect for people with allergies. Unlike cotton, wool quickly absorbs and releases moisture and is naturally mildew and mold resistant. If you have allergies and tend to drool or travel to damp places, this may be the best travel pillow material for you. Size and portability matter when it comes to travel pillows. You may find the most comfortable travel pillow of all time, but if it’s too big or hard to carry, you’re not going to want to take it on a long haul flight. This fact is especially true if you have a carry-on vs. checked bag. While travel pillows are great, they’re an extra thing to pack. Make sure your pillow is small, compact, and easy to carry. If you’re looking for the most compact travel pillow, consider an inflatable pillow. If comfort is your priority, pick one that supports you the best and feels best against your skin. Next time you embark on road trips or air travel, don’t forget to take a travel pillow with you. Use these picks of the best travel pillows, travel tips, and buying guide to make your travel more comfortable.